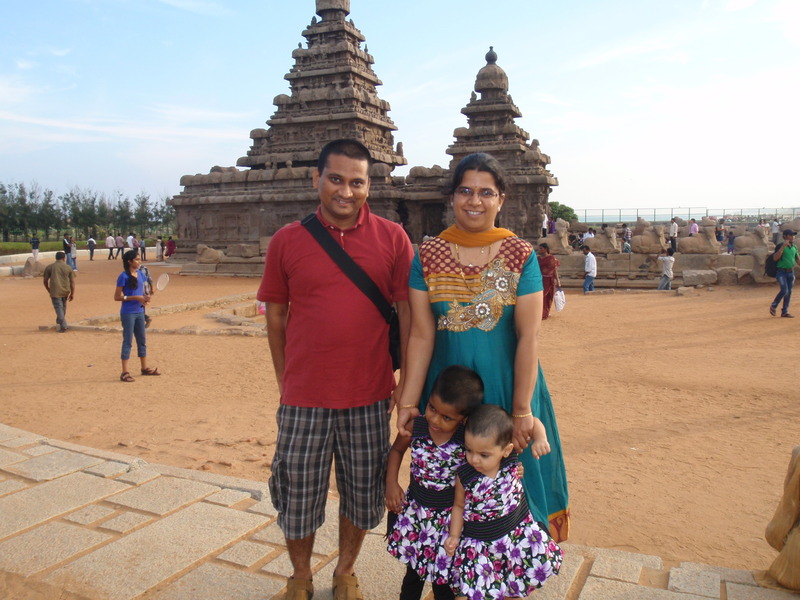 As much as Kiran and I were moving around there was destined to be one brutal travel day, and it was provided by the drive from the houseboat at Kumarakom to the southernmost tip of India at Kanyakumari. It took 10 hours to drive 140 miles. When we left the houseboat dock and drove through the middle of a jammed town I figured we’d get through it to the highway on the far side, but the jammed town continued for the entire 140 miles. 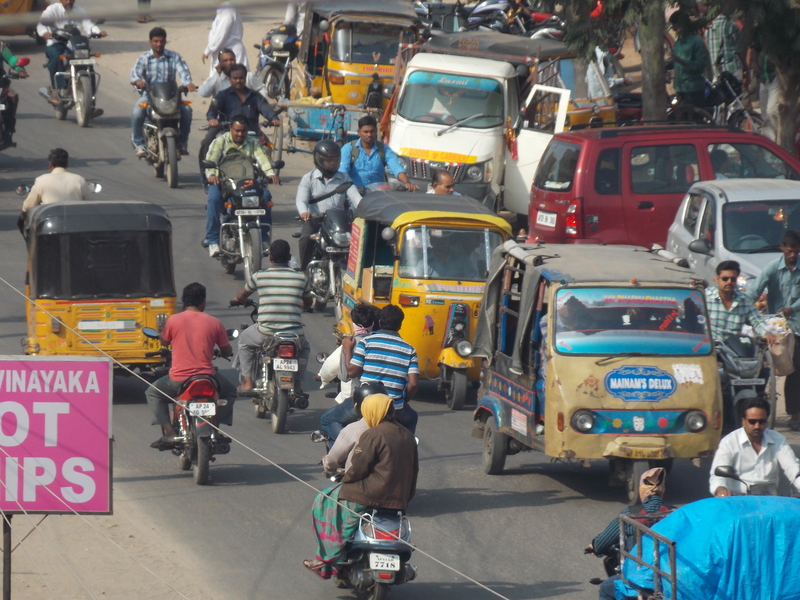 I don’t know where to begin to describe the semi-controlled chaos of driving in India. There are many buses, but there are no bus lanes so they stop in the middle of the road to pick up and discharge passengers. There are swarms of “auto rickshaws”, the yellow, three-wheeled taxis that look to be reasonably safe for three people but often carry ten. There are thousands of motorbikes, squeezing in wherever they can. There are pedestrians trying to cross the road: women with babies, old men with canes, kids without fear. There are cows on the side of the road or crossing it to go stand on the median. On this day – the first of a three-day holiday weekend – there were tens of thousands of people on our route lining the streets in a celebratory mood. over there to pass a bus that is passing an auto rickshaw and two motorbikes, it’s the responsibility of the oncoming traffic to try to give you room. If there is no room you wait until the last possible second and then force your way back in line. And so it went for ten hours on the road to Kanyakumari. tsunami of 2004. 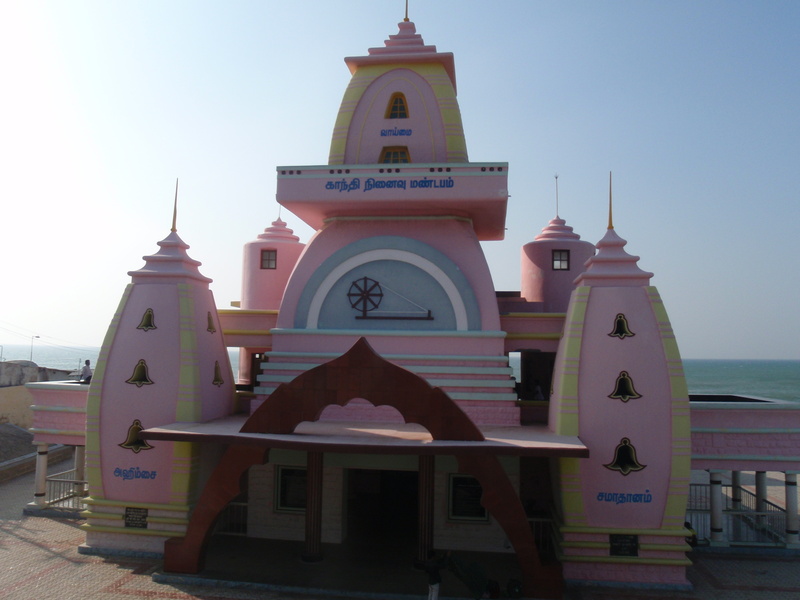 It’s a spiritual spot, the site of the impressive Vivekananda Memorial on an island just offshore and a place where thousands of people come daily to touch the sacred waters. But it’s also festive, with huge bazaars and many shops, and people come here from all over India. I looked at thousands of faces that morning and only four or five others were white. Kiran and I wanted to take the boat to the memorial but the line was too long. 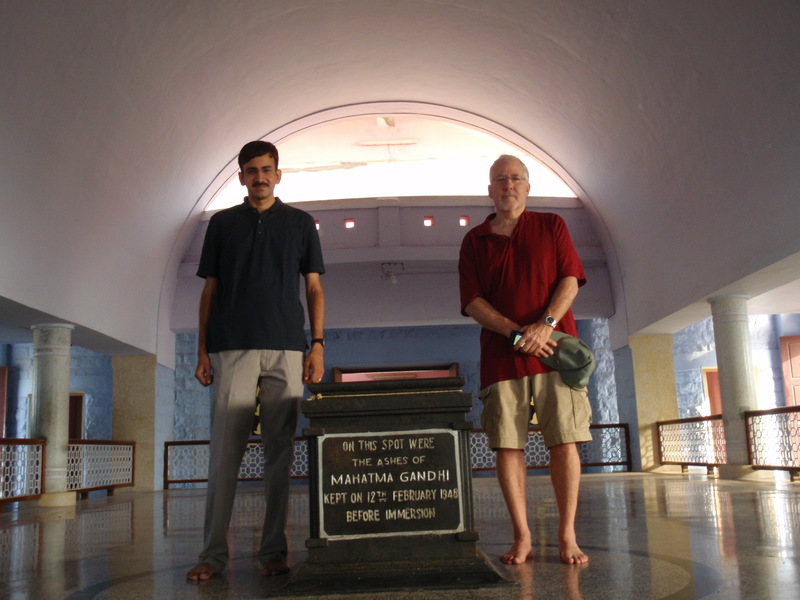 Instead we drifted over to a very pink building that turned out to be a memorial to Mahatma Gandhi. We checked our sandals and were met at the entrance by Jilal, the memorial’s self-appointed guide. He told us that after a tour of the U.S., U.K., Australia, Malaysia, Indonesia, Burma and other countries, Gandhi’s ashes had resided here before being spread in the Ganges River and here at the junction of the three seas. every year, Gandhi’s birthday, does the sun line up perfectly and shine directly down on where his ashes rested. We walked up to the top of the memorial to take some pictures. The waters here are holy to Hindus and we saw many people dipping their toes or hand in the water, some diving in off a rock. On the terrace of the memorial we met some of the young men from the group that dresses in black during their annual 40-day passage of humility, and took a few shots with them. 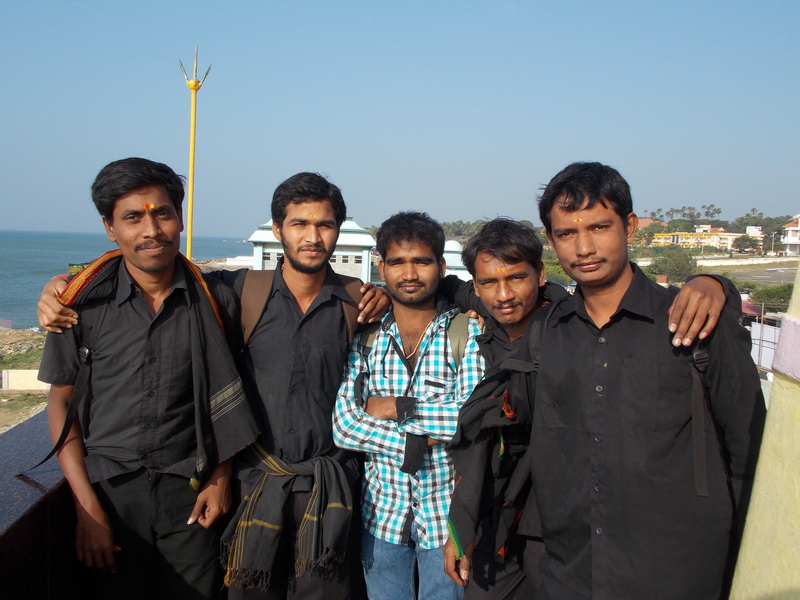 We went to the water’s edge and waded in, admired the Vivekananda Memorial and hit the road to Madurai. I don’t know how two journeys of equal length to and from the same city could be so polar opposite, but the drive to Madurai was on a modern, four-lane highway with little traffic, and what took ten hours the previous day took less than three. 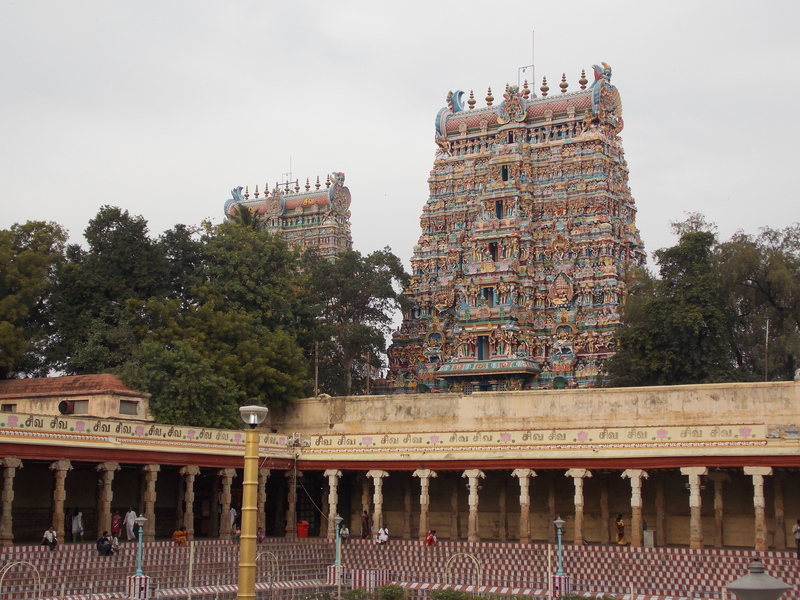 After checking in to our hotel we were met by a wonderful guy named Mahesh, a client of Prasad Chavali’s, and he took us to the Meenakshi Amman Temple, one of the biggest in India and for the purposes of my trip the Hindu equivalent of St. Peters’s Basilica and the Hagia Sophia Mosque. It was completed in 1655 and is the centerpiece of a city that has a 2500-year history. Dedicated to Meenakshi, the consort of Shiva (the Destroyer), Hinduism’s most popular god, the temple receives a remarkable 15,000 visitors per day, up to 25,000 on Fridays, and one million during a ten-day festival in April. It features 14 towers, five of them huge and visible from a long distance. Each tower was carved from one rock and is covered with colorful depictions of various Hindu deities. 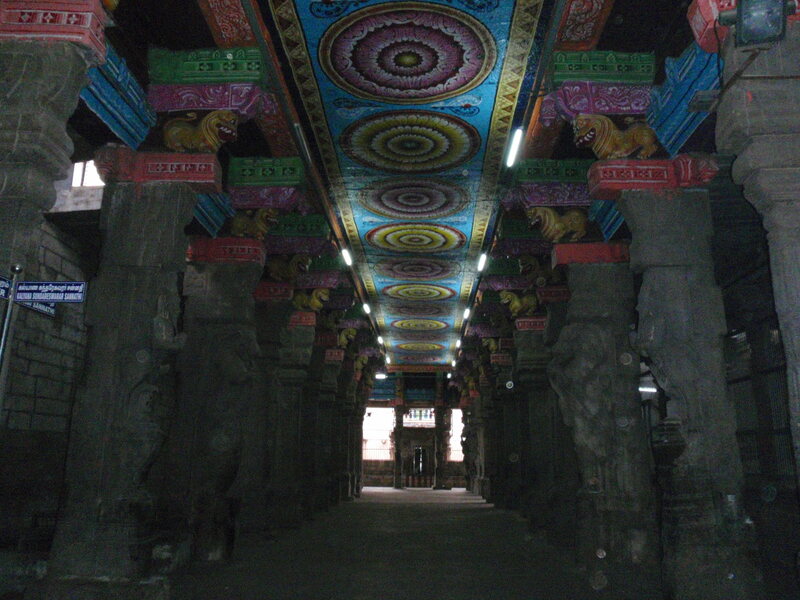 Vibrant color is a theme throughout the temple, even on the ceiling of the interior, a reflection of the celebration of life and the fact that many Hindu deities had their favorite colors. There is a Hall of a Thousand Pillars, countless shrines to various deities and a couple of inner sanctums with long lines of people waiting to enter, but only Hindus. Kiran and Makesh were apologetic about the exclusion of non-Hindus but I was very content to roam the outer corridors waiting for them, looking at the more than 30,000 sculptures. 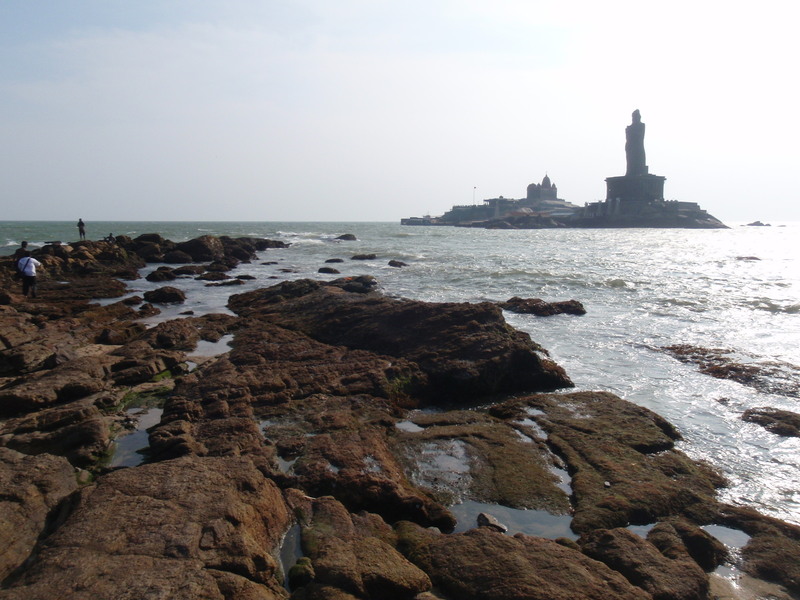 Again, I was one of just a handful of white faces, as I had been that morning in Kanyakumari. I did feel like a bit of an intruder but that was more than countered by the sense of being somewhere truly, authentically spiritual and of importance to a great many people. “It’s all of them,” he said. “And so much more.” They are not making this easy. Mahesh was kind enough to take us to dinner that night at one of his favorite spots across the Vaigai River and as part of my acclimatization routine I kicked up the spiciness factor a couple of notches, much to the amusement of the support staff watching me sweat and turn a devilish shade of red. seventh centuries. It was a holiday and the road to and from the beach was packed, and there were a lot of visitors to the ruins. It was fun and chaotic and a treat to be with a nice young family. Later Kiran and I checked into our hotel and went to a “British” pub in the basement called Geoffreys to have a beer. We were wearing long pants and dress shirts, but they wouldn’t let us in because we had on sandals. There was one guy at the bar and one guy shooting pool, so apparently they felt they had enough business. I had to laugh at the irony; in the past week I had been to a dozen places where I wasn’t allowed to wear shoes, where I got hissed at for holding shoes, and now we can’t get a beer in this dive because we’re not wearing nice enough shoes. Two flights up we found a sensible bar. I see you are going to Delhi next and I’m sure you have the spice market on your list – it’s worth it. Enjoy – I look forward to reading about it and seeing more great photos. Rae, thanks for your comments, they are appreciated. And we will definitely check out the Delhi spice market. Be well! It was fun to read your description of the various vehicles that are on the crowded roads and to then see the photo depicting the chaos! The architects of the Gandhi Memorial were so precise in coordinating the details of Gandhi’s life with the structure. Amazing!